I normally wait until my blog’s anniversary to post about the direction I want to take in the upcoming year. However, there has been a perfect storm brewing over at jIIr and the eye of the storm would have passed if I waited until my anniversary. As the New Year approaches I’m looking ahead to see the direction this blog will take. jIIr has always been a platform for me to share my thoughts and research, and this will not change. In the upcoming year I foresee some changes to the content I post due to the perfect storm that is occurring. The storm I keep referring to is the convergence of different areas in my life revolving around malware. In the upcoming year I’ll be involved in: authoring a Malware Forensic book, developing a Malware Analysis course, and taking on additional malware responsibilities with my employer. People and organizations from all walks of life are combating malware on a daily basis. The majority of the security defensive controls are ineffective at stopping the malware since attackers are bypassing them with ease. Throwing additional security controls at the issue is not the answer. What needs to be improved is the response to the malware issue; where the systems impacted are actually examined. Examining systems is one way to obtain intelligence that could be used to improve security. The question then becomes what resources are available to those wanting to take the step to start examining malware infected systems. Do those resources outline not only the process to follow but the tools to use, artifacts to look for, artifacts meaning, and provide sample data to practice on. Well, I have not been able to locate a resource to my liking addressing malware examinations. So I decided to create one and what I just describe is a glimpse of the book I’m starting at some point next year. My book is on hold because my current focus is on another endeavor. I am developing the Malware Analysis course for Champlain College’s Master of Science in Digital Forensic Science program. The course will cover a range of topics from malware fundamentals to memory forensics to malware forensics to malware analysis (reversing). It is an honor to be a part of Champlain College and I’m looking forward to do everything I can to put together a great course for an outstanding program. Lastly, I am starting to take on additional malware responsibilities with my employer. 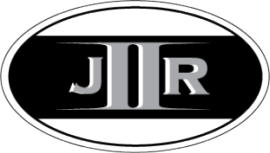 jIIr has always been a personal blog and I never discuss the work I do for my employer. I will continue to have this boundary so I won’t elaborate on what my responsibilities are besides hinting at the fact malware will take up more of my time at my job. This malware convergence means I will be living and breathing malware everyday and all day for the upcoming year. The little personal time I may have for research is going to be spent on different aspects of the malware issue. As a result, jIIr is going to be more focused on topics related to malware. I will try my best to mix in other content about DFIR or security but to be honest I don’t know if I will have the time. The perfect storm has arrived and I hope you stick around to ride it out. "If installed on Windows Vista or higher ZeroAccess will attempt to patch the Windows file services.exe. A subroutine inside services.exe is overwritten with shellcode that is carried inside the ZeroAccess dropper. 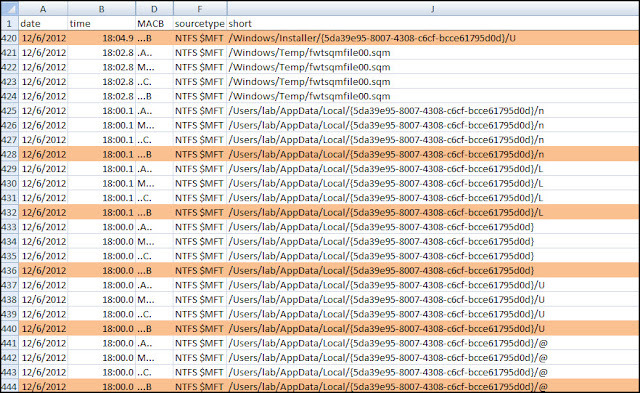 A large amount of binary data is also written to the NTFS Extended Attributes of services.exe. Extended Attributes are a feature of NTFS similar in nature to Alternate Data Streams where extra information about the file can be stored on the file system. ZeroAccess uses this feature to hide a whole PE file as well as shellcode that loads the PE file. The overwritten subroutine in services.exe reads in all the data from the Extended Attributes and executes it. The shellcode then loads and executes the embedded PE file. This file is a DLL that has equivalent functionality to the main component, so the services.exe modifications provide a backup means for the bot to function if the two main components are discovered and removed." 2. The articles don’t mention how to extract the data from the Extended Attribute. I wonder how you can do it. 3. Hiding data in the Extended Attribute is brilliant since antivirus software might not check there. Come to think about it most digital forensic tools don’t parse the data inside Extended Attributes either. 4. Wait a second; I never look at the NTFS Extended Attributes during my examinations. I need to come up with a way to do it and add it to my examination process. It could be a check underneath my Malware Searches examination step. 5. Alight, this is definitely cool. The NTFS filesystem is the default for the Microsoft Windows server operating systems as well as Windows 2000, XP, Vista, and 7. The Master File Table ($MFT) is the component in NTFS containing information about all the files and folders on the volume. “Every file and directory has at least one entry in the table, and the entries by themselves are very simple.” The entry basically consists of a header and attributes. Two attributes are the $EA index and $EA_INFORMATION which are the NTFS Extended Attributes. 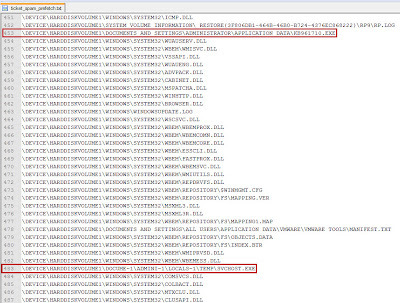 The File System Forensic Analysis book shows the $EA_INFORMATION type identifier as 208 and $EA identifier as 224 (credit goes to Harlan for this reference). The book further stated both attributes are “used for backward compatibility with OS/2 applications (HPFS).” In addition, the book Windows Internals, Part 2: Covering Windows Server 2008 R2 and Windows 7 stated “extended attributes are name/value pairs and aren’t normally used but are provided for backward compatibility with OS/2 applications”. The references provide a little more clarity about what the author of ZeroAccess is doing. They are using hardly used $MFT attributes meant for backward compatibility as a place to hide data. The cool factor with this technique went up a few notches. Before diving into the answers to all my questions I wanted to provide information about my testing environment. Knowing the testing environment makes it easier for others to see exactly what I did and how to replicate my testing. For those looking for the “good stuff” skip ahead to the section Extracting Data from NTFS Extended Attributes. 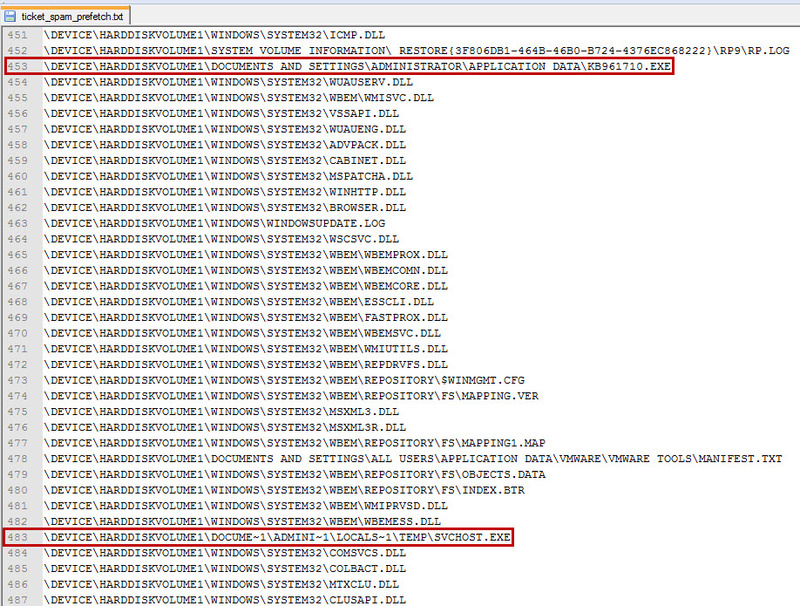 In all the articles about ZeroAccess using the NTFS Extended Attributes I noticed one commonality; this technique was used in an updated version of the Trojan. Check out the commonality: HitmanPro posted their write up on June 25, 2012, Symantec did theirs on August 14, 2012, and Sophos report was released in September 2012. Furthermore, Sophos stated in their opening sentence “since our last paper on ZeroAccess, The ZeroAccess Rootkit, its authors have made significant changes.” The point was crystal clear, I needed to find a recent ZeroAccess sample in order to find one leveraging the $EA hiding technique. I searched for samples in the Virus Share malware repository as you will see why shortly. A generic search for “zeroaccess” wasn’t to helpful since it resulted in 6,056 results. I needed a more focused search so I turned to Symantec’s detection Trojan.ZeroAccess.C. It reduced my search results to 9 samples. A nice feature about Virus-Share is it provides links to each sample’s VirusTotal’s report. I used the VT report to further narrow down my samples. On VirusTotal’s Additional Information section, I first looked to see when each sample was first seen. Remember the commonality with the articles? I only wanted to focus on samples first seen within the past few months. The second check I did on the Additional Information section was to look at the TrID output to determine what samples were executables as opposed to DLLs. Working with an exe makes it a little easier for fast execution. I narrowed my samples down to five based on the above checks. 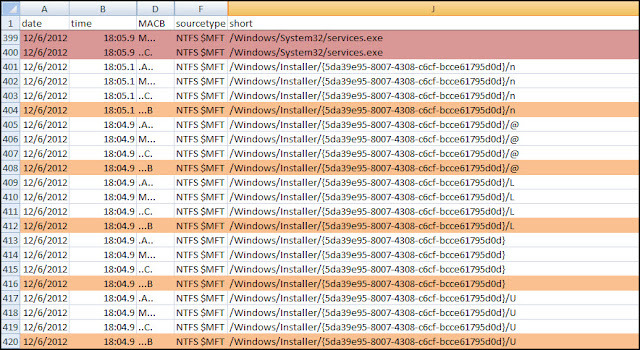 Not every ZeroAccess Trojan will modify the services.exe and store binary data in the NTFS Extended Attribute. 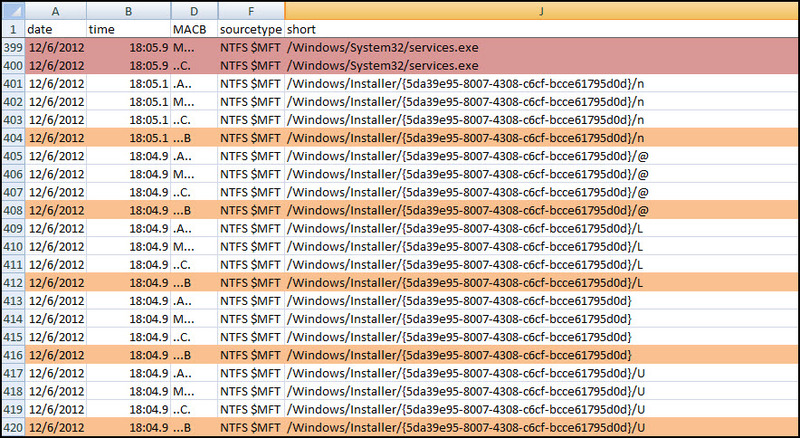 So I started executing one sample after another to see if any modified the services.exe MFT record. I didn’t do any dynamic analysis; I pretty much just ran a sample and then looked at the services.exe MFT record to see if the Extended Attributes were added. On the third sample I hit pay dirt. The sample MD5 hash b437274492e215c25f96711d04b44050 (SHA256 658817f5f7722506868d9f717ee19b276fcab0d0ecac071d5d92a4178fdeb5b3) leveraged the NTFS Extended Attributes. Side note: I mentioned in the Win4n6 group I was looking for ZeroAccess samples that used the NTFS Extended Attributes. Stefan replied with not only the MD5 hash c6e73a75284507a41da8bef0db342400 but links to the article ZeroAccess - new steps in evolution and the ThreatExpert Report. This sample is the next one I’m going to check out. The Sophos report indicated the services.exe is only patched if ZeroAccess is installed on a system with Windows Vista or higher. I selected for my test system Windows 7 Ultimate 32 bit which I was running inside VMware. I used a fresh install and the only configuration change I made was to disable the User Account Control. I wanted to avoid making ZeroAccess elevate its privileges. I also installed the program Capture.bat as a quick way to see changes made to the file system. Note: the TSK tools can be ran against a forensic image or a mounted drive. My examples throughout the post are against a mounted drive (\\.\PHYSICALDRIVE#) but the path to a forensic image could be used instead. Command explanation: the –o switch is to specify the sector offset that was discovered with mmls and the –n switch is the file name to get the inode for. Command explanation: the –o switch is the sector offset and the 12345 is the place where the inode number goes. The attributes of interest are $EA_INFORMATION (208) and $EA (224). Command explanation: the –o switch is the sector offset and the number at the end is the inode number with the attribute value added. The 208-# dumps $EA_INFORMATION and 224-# dumps $EA. The above process can be used to either read a MFT’s record attributes or dump the data stored in those attributes. What Does a Clean MFT Services.exe Record Look like? It’s always good to know what normal looks like so it’s easier to see what is abnormal. This was my thinking and why I first looked at a clean MFT services.exe record. Here’s what I did and what it looked like. I highlighted in blue values of interest. 1. Confirmed the starting sector for the partition. 2. Identified the inode number for the C:\Windows\System32\services.exe file. 3. Reviewed the attributes associated with the C:\Windows\System32\services.exe MFT record. Notice there are no $EA or $EA_INFORMATION attributes listed under the Attributes section. The clean C:\Windows\System32\services.exe file only had four attributes listed. The $STANDARD_INFORMATION (16-0), $FILE_NAME (48-4), $FILE_NAME (48-2), and $DATA (128-3) attributes. Here’s what an infected services.exe MFT record looks like and what I did. I highlighted in blue values of interest and items related to the infection in red. 3. Reviewed the attributes associated with the C:\Windows\System32\services.exe MFT record. The infected MFT services.exe record had a few different changes. The inode number for C:\Windows\System32\services.exe changed from 19211 to 42756. In addition, the attributes now listed the NTFS Extended Attributes: $EA_INFORMATION (208-3) and $EA (224-4). The ZeroAccess binary data can now be extracted using the attribute values shown with istat. Here’s how I extracted the data. 4. Extracted the binary data from the MFT record for C:\Windows\System32\services.exe for both the $EA_INFORMATION and $EA attributes. The Sophos report indicated the ZeroAccess binary data stored in the NTFS Extended Attribute is shellcode and a DLL. This means I had to separate the two in the dumped data; my focus was only on the DLL. There was very little data stored in the $EA_INFORMATION attribute while the majority of the data – including the DLL – was in the $EA attribute. 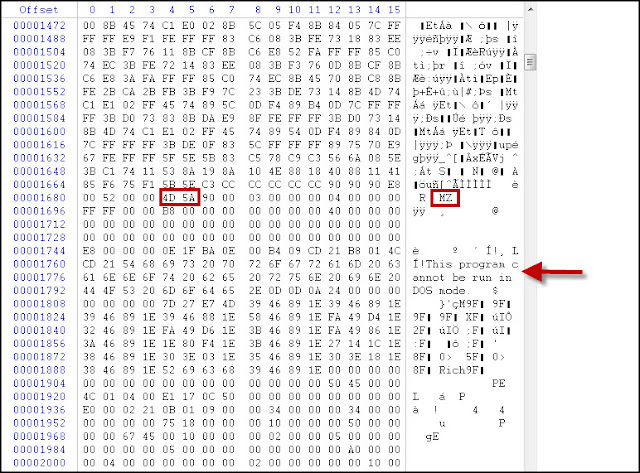 To rebuild the DLL I opened the extracted data in a Hex editor and looked for for a PE file’s characteristics. I was looking for the MZ file signature and the MS-DOS message. I located the MZ signature at offset 1684 so I copied out the binary data from offset 1684 to the end of the file. The resulting file was SHA256 ee14dcd20b2ee118618e3a28db72cce92ccd9e85dd8410e02479d9d624934b13 which was detected as the ZeroAccess Trojan. Locating the infected services.exe file and extracting the binary data from the NTFS Extended Attributes only addresses one part of the infection. ZeroAccess drops other files on a system and I wanted to find these as well. However, I didn’t want to cheat by looking at my Capture.bat log file. I wanted to verify how a system timeline worked by using the services.exe as a starting point to find the other malicious files. Timelines are my go to tool when I’m trying find files associated with an infection. A timeline can reveal other activity occurring on a system around a certain time of interest. In this case, I was interested in seeing the activity around the time when the services.exe file was last modified as shown below. (the timeline was created with AnalyzeMFT). 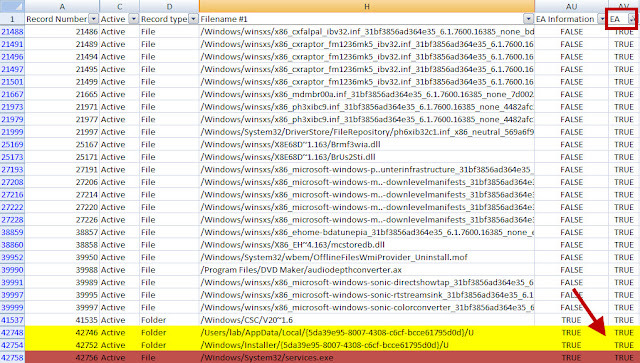 The timeline showed the services.exe file was modified on 12/06/12 at 18:05:09. The activity beforehand included the creation of files and folders in both the C:\Windows\Installer and C:\Users\Lab\AppData\Local folders. The file named n in both locations is the ZeroAcess Trojan. Storing data inside the NTFS Extended Attributes is a clever way to hide data. Based on the reports I read, ZeroAccess started to use this technique within the last year. So far it appears as if this is not a commonly used technique to hide data among malware. The only reports I could find only talked about ZeroAccess. 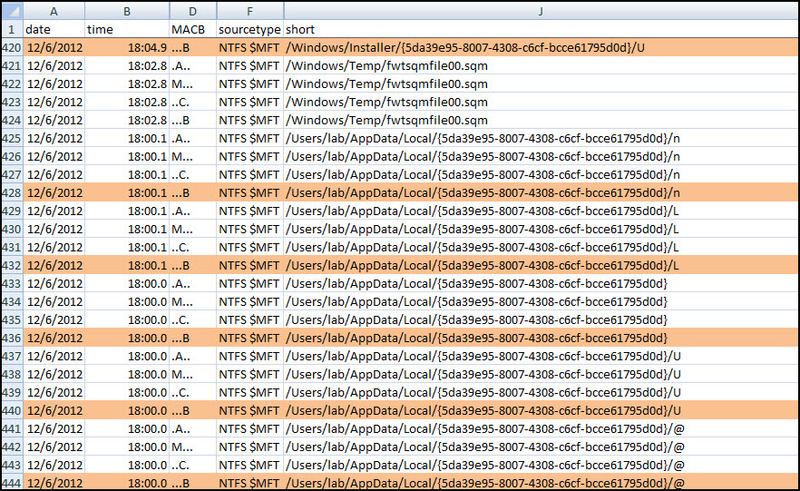 However, in time I would not be surprised to see other malware families trying to use NTFS Extended Attributes. To see why just think about these two questions: how many tools are checking the NTFS Extended Attributes for every file and how many DFIR practitioners and IT staff are actually aware that malware can be hidden there? If I was a betting man I’d put my money on both answers being “very few”. My eyes are opened to this hiding technique and I added a check underneath my Malware Searches examination step to account for it. If I ever need to determine if something is leveraging NTFS Extended Attributes then this is the process I will use. Import analyzeMFT’s output into Excel or Calc (output is comma delimited format). Apply a sort on the $EA attribute being true to show every file with a NTFS Extended Attribute. 2. Locate the files’ of interest MFT records. AnalyzeMFT’s output contains this information. 5. Make note of the NTFS Extended Attributes $EA_INFORMATION and $EA. In istat’s output, next to the attribute name will be a value inside parentheses. Knowing the programs that executed on a system can answer numerous questions. The answers can help on a range of cases from acceptable use policy violations to investigations to intrusions to malware. One program execution artifact is prefetch files which have been well documented including in the article Decoding Prefetch Files for Forensic Purposes and on the Prefetch Wiki page. The purpose of this post is to explore the NTOSBOOT prefetch file and how it is relevant for malware investigations. The Windows operating system enables prefetching to make system boots or applications startups faster. Windows Internals, Part 2: Covering Windows 2008 Server R2 and Windows 7 states “the prefetcher tries to speed the boot process and application startup by monitoring the data and code accessed by boot and application startups and using that information at the beginning of a subsequent boot or application startup to read in the code and data”. Prefetch files are what store the information required for faster startups. The NTOSBOOT prefetch file stores the information related to the boot process. The information in this prefetch file reflects the files accessed during system startup. Specifically, the files accessed, according to the Windows Internals, “from system start through the 30 seconds following the start of the user’s shell (typically Explorer) or, failing that, up through 60 seconds following Windows service initialization or through 120 seconds, whichever comes first”. The NTOSBOOT prefetch file in question came from a system I infected last year by opening the attachment in a NYS Department of Motor Vehicles Uniform Traffic Ticket email. Looking through the file handles for any unusual file paths (files in temporary folders, unusual file names, etc) I came across three suspicious files as shown below. The first file 17F7FFF4.COM was suspicious since the file was located in the All Users temporary folder. The second file KB961710.exe was suspicious because Windows updates are not stored in the application data folders. The last file SVCHOST.EXE was suspicious since not only was it located in a temp folder but the svchost.exe file is normally located in the Windows\System32 folder. I located these files by solely reviewing the file handles referenced in the NTOSBOOT prefetch file and the screenshot below confirms my suspicions. Program execution artifacts are vital when examining a system infected with malware. Despite malware’s best efforts to hide on a system at some point for them to do their jobs they have to run. When malware eventual runs there will be traces of its execution left on a system which can be used to find its hiding spot. The NTOSBOOT prefetch file is one such artifact and the file handle information will reveal what’s hiding on a system.